Which gets better mileage, the eBike or eScooter? Treehugger has just posted a comparison of the eBike with the eScooter – and to make it a fair fight, they’re talking low speed eScooters, not Vectrix-type dealies. To be honest it’s a bit of a no-brainer – 25kg vs over 100kg weight for a start, and vastly bigger battery packs on the eScooter. Read the verdict over here – but you can guess what I was expecting, right? Is this fantastic video from cycle stuntman Danny MacAskill. No, it’s not an eBike but it’s just so out-of-this-world incredible that I’m posting it anyways. Check it out below. 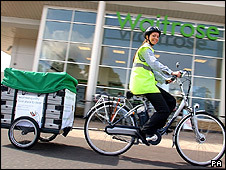 c/o the BBC: UK Supermarket chain Waitrose has begun a small pilot program with four stores for groceries purchased online to be delivered by electric-assist cargo bikes. The bikes can carry up to 6 trays of groceries and keep food frozen for 2 hours. While the bikes will only be doing a small portion of deliveries the store makes, it’s a step in the right direction and the store will not need to purchase any new delivery vehicles for the time being – with any luck this will be the way they’ll continue to grow their delivery fleet! Full story and video available here.